the faces like goblets I’d drain then put back in the cupboard. Akbar's poems revel in excess ("I need to be broken like an unruly mustang") and in exaggeration ("I don’t know how anyone does anything") and white space zigzags through many of his poems, creating dramatic gaps between clauses that reflect the legerity of the poet's unglued mind. And while these gaps are presumably intended to be caesuras, they almost never read as actual pauses, but instead as saccadic agitations that accelerate readers (rather than delay them) into the next phrase. When taken together, all of these gestures are, for the most part, tedious. And yet sometimes worth enduring: grappling with Akbar's tentacular perceptions, as they shift between the ill-defined (the result of the poet's unrestrained use of indefinite pronouns and determiners) and the precise (expressed in his marvelous similes and metaphors) can be thrilling, but for the most part the combination of vagueness and specificity, which is sustained throughout Calling A Wolf A Wolf, is taxing. It would be too toilsome (and impolite) to list each time Akbar takes non-specific language and jams it against striking imagery, but it's worth noting because it's a technique baked into so many of his poems. Once you notice it, it's impossible to ignore. (It's ironic that a book about alcoholism can so easily be turned into a drinking game.) This stylistic quirk (along with his regular deployment of melodramatic adverbs like always, often, once, never, sometimes) gives his speaker a storybook voice that's stomach-churning ("I remember someone/once sang here, once/strung together//a garland of near-holy moments") and since the poet's methods are so conspicuous, the poems in Calling A Wolf A Wolf often feel gimmicky. In the cross-pressures of intoxication and religion, the poem ends, and it points to Akbar's broader dilemma in Calling A Wolf A Wolf: if being wasted is no longer a viable way to access enchantment, where shall he find it in the "flat" districts of sobriety? Fangs, the stuff of animal consumption and violence, show up as well in the Carolus Linnæus epigraph preceding the poem, "Personal Inventory: Fearless (Temporis Fiaa)," a poem where Akbar says, "My straight white teeth have yellowed/and I can’t tell a crow from a blackbird," suggesting the cost or challenge of recovery (or depression) is not losing the ability to name, but struggling to know where to invest those names. 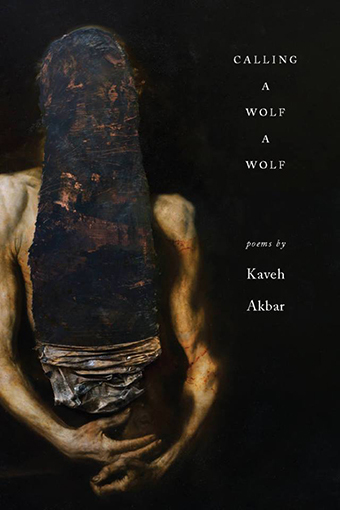 With so many contradictory notions coursing through Calling A Wolf A Wolf, a reader never knows whether to interpret them as part of some broader existential attitude held by the poet or if they're just the byproduct of Akbar's rapturous disposition or perhaps, more simply, an allegory for transformation. When he says, "I have been so careless with the words I already have," then later writes, "I choose/my words carefully" it reflects that his private allegiances have changed (or intend to) from desire to seeking transcendence. And here, Akbar disparages the body as a nuisance—"Every day//my body follows me around asking/for things"—but also views the body as a "mosque borrowed from Heaven" and admits to "trying to exalt/my own body." All this waffling can also be read as an attempt at synthesis and might explain the book's final words: "The boat I am building/will never be done." In other words, the poet is perpetually brainstorming; a spirit constantly in process. Akbar puts a lot of pressure on himself "to think louder, try/to be brilliant, wildly brilliant" and as a reader, instead of sympathizing, we feel a little threatened by the confession, like when he writes, "According to science/I should be dead," which sent chills down my spine because I knew then that the speaker sees himself as a miracle. Few poets write with such an all-pervasive aura of earnestness as Akbar, but it rarely strikes me as genuine because the poet's entire style seems rooted in a kind of despotic self-glorification. Akbar's language bullies, harasses, and hectors the sacred out of the everyday so the world appears more like he feels and there's a name for that: narcissism. After steering through nearly 90 pages of sublunary images, nebulous aphorisms, brooding epiphanies, and blunt confessions—not to mention coming across lines like "I like it fine, this daily struggle//to not die" and "my gurgling internal devotion/to myself" and all the body parts (I counted 89 separate ones) and routine suffering-signaling, I find myself wondering if Akbar has transferred a passion for Thanatos into his poetry ("I do hope one day to be free of this body’s dry wood") in order to rid himself of it—and for us to take on—as the poet freely celebrates in his work the discovery of his latest intoxicant: himself. By the time he tells us that his "favorite drugs are far from here," readers should be forgiven for doubting him.